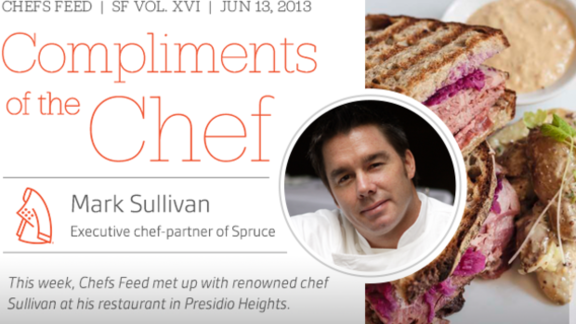 This week, Chefs Feed met up with renowned chef Sullivan at his restaurant in Presidio Heights. CF: I'm best known for my _______ cooking but I can make one hell of a _______. MS: I'm hoping they would say fair and respectful. I feel like I run the kitchen with a lot of integrity. I try to create a culture that is full of these qualities because that's what's really important to me. MS: I'm excited about our new café at Spruce, which is open Monday through Friday from 10am to 2:30pm. In the morning, we offer to-go items such as fresh pastries, quiche, and coffee, and at lunch, we have a selection of sandwiches and salads, including a house-cured pastrami with sauerkraut, gouda, and Russian dressing on grilled levain. There is also a retail element with offerings such as olive oils, vinegars, salts, cookies, and more. MS: Alain Ducasse at Louis XV in Monaco. My wife and I actually had reservations there while we were passing by on a cruise ship. We got a babysitter in preparation for the night, but they won't let you leave your child on the ship—go figure. So unfortunately, all we could do is watch from afar. MS: Guests sometimes don't understand that not all food needs to be burn-your-mouth hot. There are certain dishes, like our poached salmon, that will get ruined if they're too hot. Poaching is generally done with low- to medium-temperature cooking, but never with high heat. CF: Secret off-the-menu item that your guests can order tonight. MS: Australian winter truffles, which can be added as a supplement to any of our dishes on the menu. MS: A lot of young chefs want to move through their career too quickly. They often come in with false expectations of how much work is required to get to a place where one is named chef or sous chef. My advice is to focus on basic, tried and true cooking techniques, such as how to roast, sear, make a proper soup, and break down a whole animal. MS: Savory roasted chicken with thick-cut bacon lardons, slow-cooked kale, and potatoes.